Fawad Chaudhry, PTI spokesperson, said they would take decision regarding the same after consulting with Pak Foreign Office. 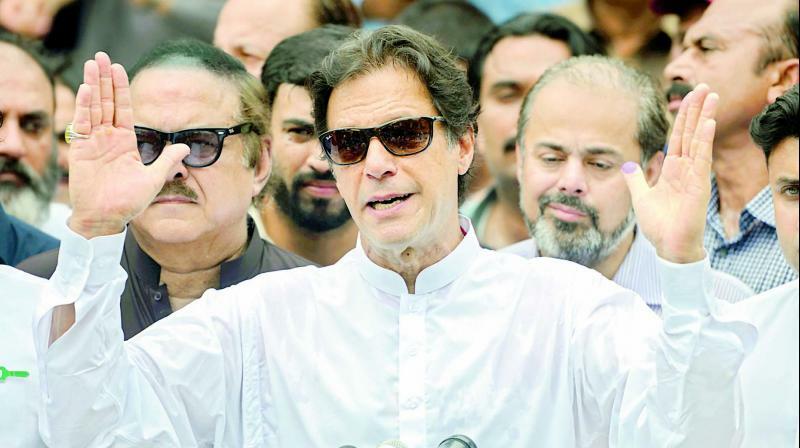 Islamabad: The Pakistan Tehreek-e-Insaf (PTI) on Tuesday rebuffed reports which claimed that the party was planning to invite foreign dignitaries to the oath-taking ceremony of its chairman Imran Khan as Pakistan's Prime Minister and added that the decision on the same is pending. Fawad Chaudhry, the PTI spokesperson took to his Twitter handle and said that they would take the decision regarding the same after consulting with the Pakistan Foreign Office. "Media speculations about international dignitaries attending PM oath ceremony are not correct. We have sought the advice of Foreign Office on the matter and will decide accordingly #PTI," he tweeted. Earlier in the day, some media reports suggested that the PTI was considering inviting leaders from South Asian Association for Regional Cooperation (SAARC) countries, including Prime Minister Narendra Modi, to attend Imran's oath-taking ceremony in Pakistan. According to figures provided by the Election Commission of Pakistan, the PTI was declared as the single largest party in the recently-concluded general election. The party, however, fell short of the 137 majority mark as it won 116 of the 270 National Assembly seats. The party leadership is reportedly in talks with other political parties and independent candidates in a bid to woo them to join its ranks to form a coalition government at the centre.